TALENTED teens Michael Selsby, Alex Davies and Kevin Canendo did their growing reputations no harm as shining lights for the AFL Cairns under-17 Lions squad. 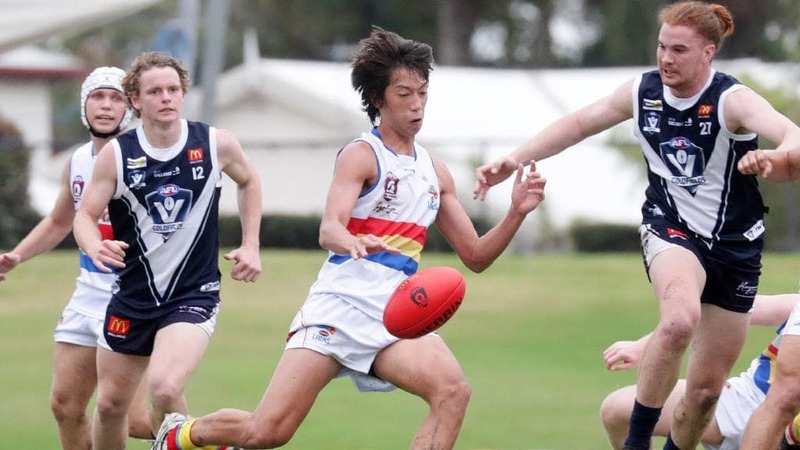 Just as they did in 2017, the Lions, made up of the best ­juniors in the Far North, found the going tough in the annual representative game at Cazalys Stadium on Sunday afternoon against AFL Goldfields. The Lions, most of whom also played for their clubs on Saturday, were in the game for the first quarter before the ­Victorians, made up of the ­Ballarat, Maryborough Castlemaine and Riddell District football leagues, blew them away in the final three terms. To the Lions’ credit, they never gave in and were still competing late into the final term in the 5.0 (30) to 16.14 (110) defeat. Centrals Trinity Beach ­junior Selsby, Manunda Hawk Davies and Canendo, who started at Pyramid Power before crossing to Cairns City Lions, were all busy for the Lions in the defeat. “It was good to play against a Victorian team and expose us to how they play,” Davies said. AFL Cairns operations manager Craig Lees, who coached the Lions, hopes the squad of juniors will take what they have learnt back to their clubs. “The scoreboard is not pretty but it is not about there for our guys, this game is more about our best juniors being exposed to a really good program,” Lees said. “It is about learning and taking that to their club. “We were outnumbered and beaten around the ball in the game but it is about then challenging the players after the game about what they learned.